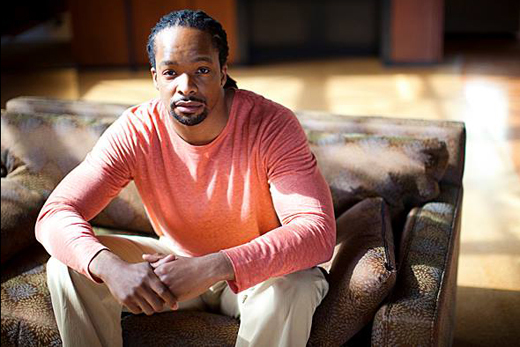 Jericho Brown, assistant professor of English and creative writing, was nominated for the NAACP Image Award in the category of "Outstanding Literary Work – Poetry" for his latest poetry collection, "The New Testament." Courtesy photo. Standing on the red carpet leading into the Pasadena Civic Auditorium at last week’s televised 46th NAACP Image Awards, poet Jericho Brown found himself immersed in an experience both exhilarating and humbling. Brown, an assistant professor of English and creative writing at Emory, was attending the gala event as a nominee in the category of “Outstanding Literary Work — Poetry.” His latest collection, “The New Testament” (Copper Canyon Press), was among a field of five distinguished finalists, a recognition that honored him deeply. But on that night, the nomination was only the first of many thrills. To his right stood Academy Award-winning actress Octavia Spencer. To his left, Emmy/Golden Globe/Screen Actor’s Guild-nominated actress Kerry Washington — among hundreds of top performers in film, television and music, as well as directors and writers, gathered for the Friday night ceremony. 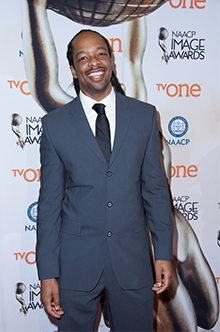 Poet and professor Jericho Brown pauses on the red carpet at the NAACP Image Awards Luncheon on Jan. 17, one of several events leading up to last week’s awards ceremonies. Photo by Earl Gibson III. Amid the glare of spotlights and a swarm of press photographers, there was a sudden moment of confusion as the carpet became overcrowded. Someone began directing everyone to move this way, another person telling them to move another direction. To Brown’s surprise, he felt a hand on his arm. It was Octavia Spencer. “I’m really sorry about this,” she told him. For Brown, it brought a moment of realization — recognition that the acclaimed actress saw them all as artists in the same position. And it became one of the highlights of his evening. The evening marked Brown’s first experience attending a “red carpet” event, and while he did not win in his category, the experience did not disappoint. “It is an honor to be recognized by an organization as ‘historied’ as the NAACP,” Brown says of the event, which celebrates the outstanding achievements and performances of people of color in the arts, as well as individuals or groups who promote social justice through creative endeavor. “Whether you’re an actor or singer, poet or painter, it often feels that the time between moments of recognition are very desolate: What’s going on? Why am I doing what I do?” he reflects. “The NAACP awards put you in contact with these other artists, and not necessarily those in your field. There is a certain kindness that is experienced among artists when we simply see one another,” he adds. Brown’s nominated book of poems, “The New Testament,” was written as a memorial for a cousin — as close to Brown as a brother — who was murdered in Shreveport, Louisiana, where they both grew up. “Like any book I write, I simply think of it as a book of love poems. It allowed me to rededicate myself to poetry and to go back to the roots of things I know and love, childhood memories, family members, and old loves,” says Brown, who is now touring to discuss the collection, which also was named to “book of the year” lists by the Library Journal and the American Academy of Poets. Beyond the NAACP recognition, the evening also brought a happy consolation — the winner of the poetry category was “Citizen: An American Lyric ” (Graywolf Press) by Claudia Rankine, who was one of Brown’s teachers at the University of Houston, where he received his PhD in literature and creative writing.